Black Roe Poke Bar and Grill launched in the heart of Mayfair in March 2016 and it’s one of my favourite spots. The dark grey, portrait-hung walls create a cocoon of calm in Mayfair. It isn’t glitzy, you don’t have to be an A-lister to be allowed in, but it is smart-casual, with delicious embellishments. The Poke Bar is in the window to attract passing traffic, although there is very much more here than this fresh and flavourful Hawaiian dish. There is a menu that offers cooked specialities, and they are a unique and memorable bunch. The bill of fare has recently changed, and I jumped at the chance to re-visit. It wasn’t a matter of seeing if Black Roe had improved. Oh, no, it was to check that it was still just as good as I remembered. And it is. This small 60-seat gem has its focus on Pacific Rim cuisine. Think of Japan with a hint of Korea and of course Hawaii. The food here likely won’t be found in other restaurants. It’s light, flavourful and attractive. And the cocktails are extraordinary. My go-to cocktail at Black Roe is the sharp and tangy Yuzu Grapefruit Collins. I am a sucker for anything sour and this is a marvellous example of a sharp pre-dinner drink. This must be well-chilled and served with plenty of ice. It isn’t over-garnished (it’s no worse for that) and one taste will have the recipient hooked. 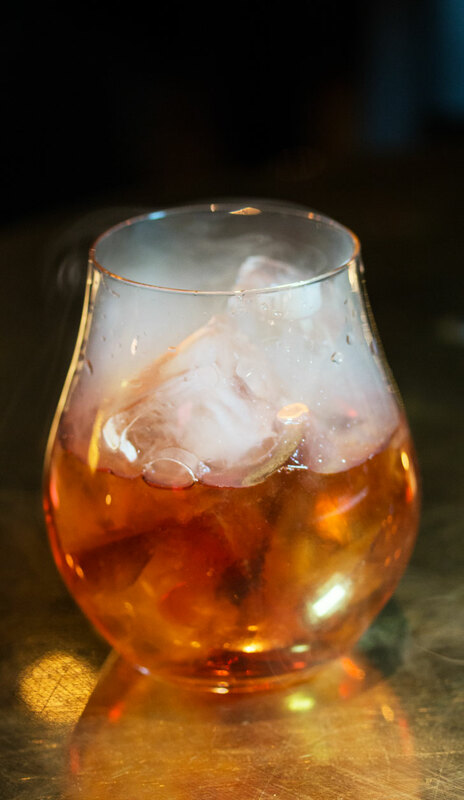 Smoky Apple Negroni – Nikka from the Barrel Whisky, Cocchi Americano (a quinine-laced aperitif), Campari, Manzana Verde – are combined and then infused with apple smoke. Yes, this is mixology theatre. That smoke is real. The barman honestly has burnt a bit of tree! Both smoke and beverage are poured over ice to great effect. This would be the cocktail of choice for any Campari lover. Spicy Mai Tai is a must-try at Black Roe. Rum, Cointreau, chilli, almond syrup and pineapple juice together present a belt of heat with a fruity finish. I am going to steal the recipe. It might not be given freely, so there is the prospect of bribery. Yes, it’s that good, but it’s not for the faint-hearted. But we were actually here for the food. Katakuriko Crispy Squid tossed in an oyster dressing was just as the name suggested. This is a dish over which to fight. The crunchy coating on the seafood makes this a winner. Not a hint of grease to detract from the light preparation. 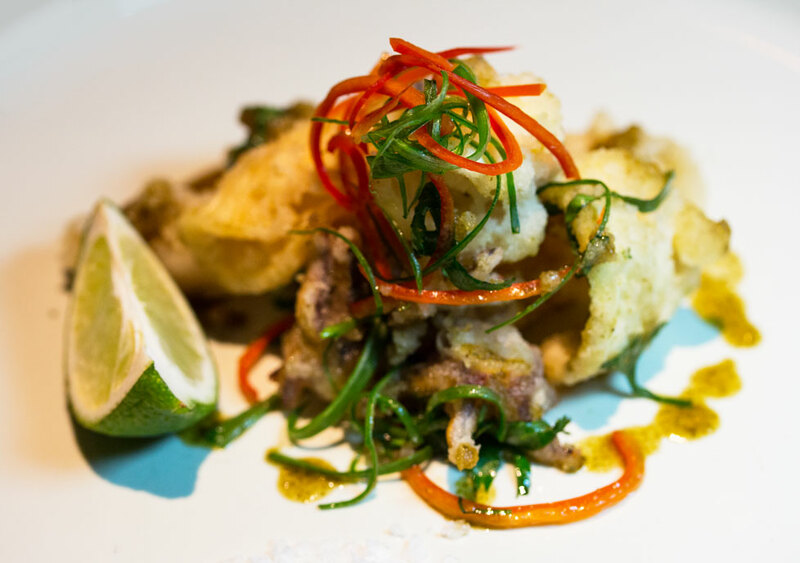 I would be content, on a quick visit, to have just a plate of this squid and a cocktail! 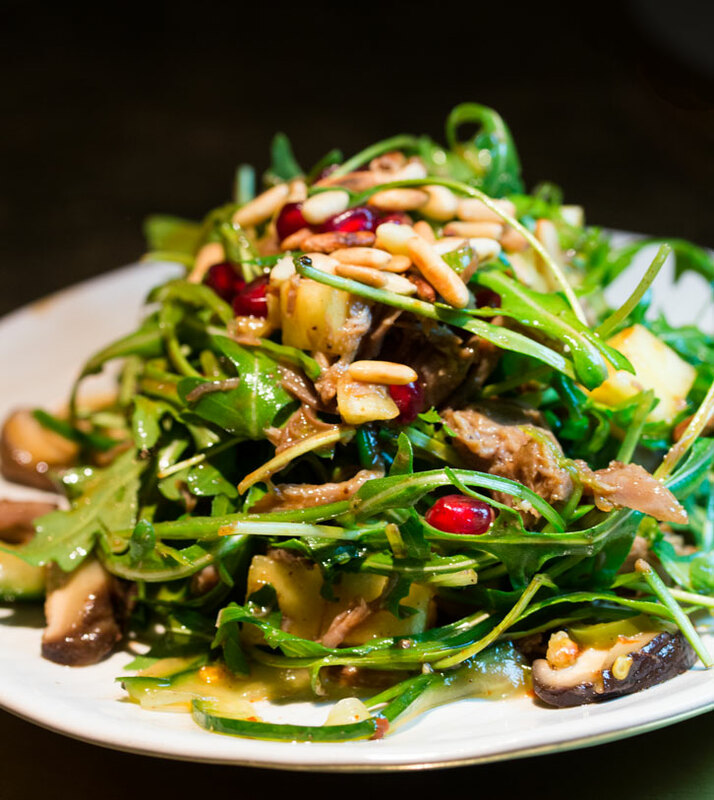 Confit Duck Leg Salad – rocket, pine nuts, pomegranate, diced pineapple – had robust ducky flavour. It was a colourful and delicious dish of succulent meat with a large portion of spicy rocket greens, which was a great carrier for both meat and fruit. Steamed Mussels in a fragrant coconut broth is new to the Black Roe menu and it should definitely stay. It has all the spices familiar to lovers of Thai food but without the over-chilli heat. The substantial mound of mussels was delicately spiced but remained recognisably Thai, with plenty of sauce left over to be consumed atop a bowl of steamed Nishiki rice. Nishiki is a premium, medium-grain Japanese rice that becomes fluffy and sticky when cooked. It’s an ideal vehicle for mopping sauce. 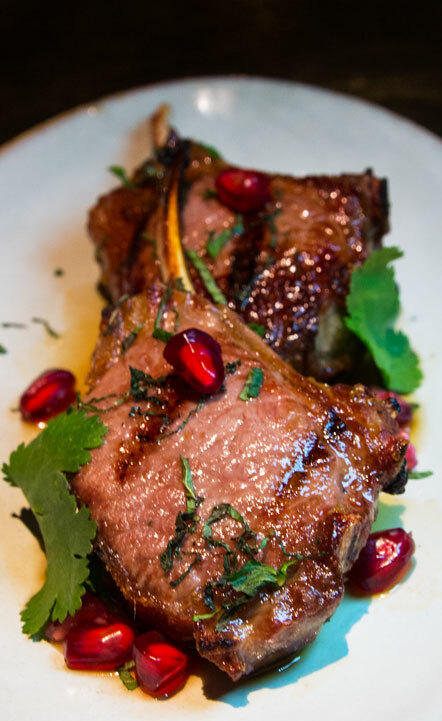 Waimea’n Sticky Lamb Ribs are glistening, moist, cooked to pink perfection and will be sought-after by carnivores. A beautiful and simple presentation. Anise Glace with hibiscus-poached pear and milk cracker was my guest’s dessert. This was an attractive plate which tasted as good as it looked. The pyramid of white kulfi-like ice-cream was delicately flavoured but the blush-red fruit was the star. The garnish of violas gave a nod to the Spring which we hope will arrive in the coming months. Black Roe is my kinda restaurant. It has a convenient location, relaxing ambiance, some of my favourite dishes, and cocktails for which to die. We will return.